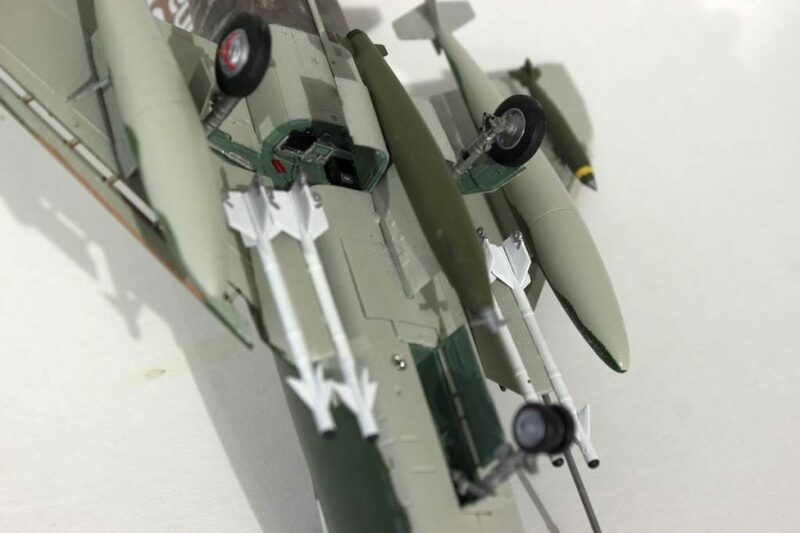 Fresh off the bench is my latest, the North American F-100D Super Sabre, a Trumpeter 1/48 scale kit. 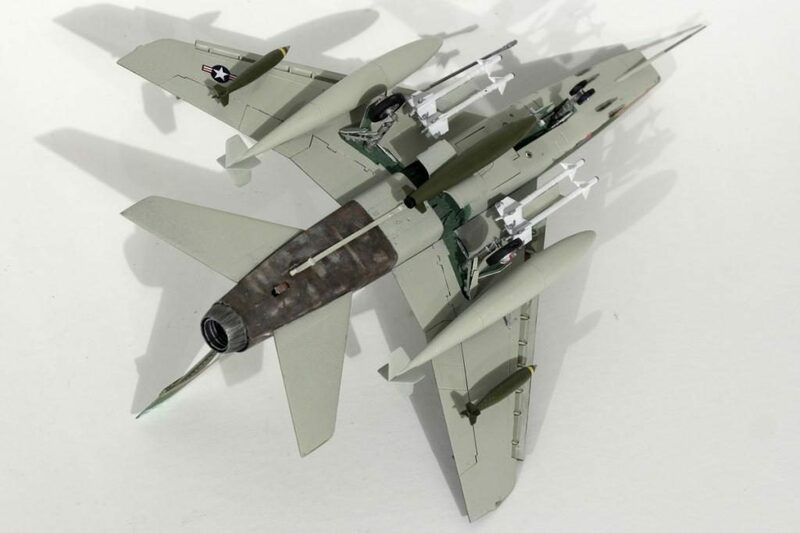 I didn’t start out to build models of jets, but this my 3rd one now, so I guess they are pretty fun too. The kit offers 4 marking schemes, two American and two French version. I chose the 1970 Viet Nam U.S.A.F. version, from the 30th TFS, 31st TFW, Tuy Hoa Airbase. It should be no. 55-3634, but the large white number decal that goes on the tail and reads ‘634’ disintegrated and I couldn’t use it. Fortunately I was able to find the ‘102’ decal in my leftovers which the right block letting and almost the exact right height, so it fit. Call it 55-3102 then. 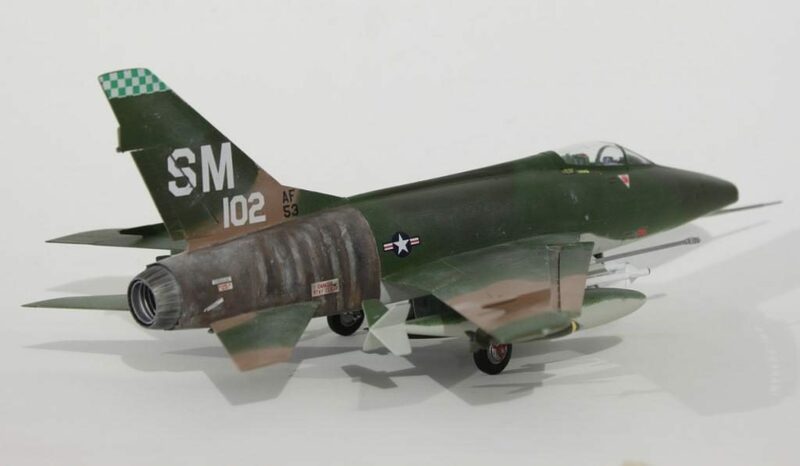 I painted it overall with Model Master rattle can, medium green, dark green and dark tan and camoflage gray undersides, after spraying the whole thing silver to start with, which allowed for me to try some paint chipping effect when I got to the weathering stage. I also used some Tamiya weathering powder for that too, aiming for a not-over done but somewhat faded look. I added the bombs on the outer wings from my spares and leftovers box. The rear of the fuselage… well, the instructions said it should be painted ‘burnt iron’. I have seen that called for in other kits, but not for such a large prominent portion of the exterior, usually an exhaust or motor part. 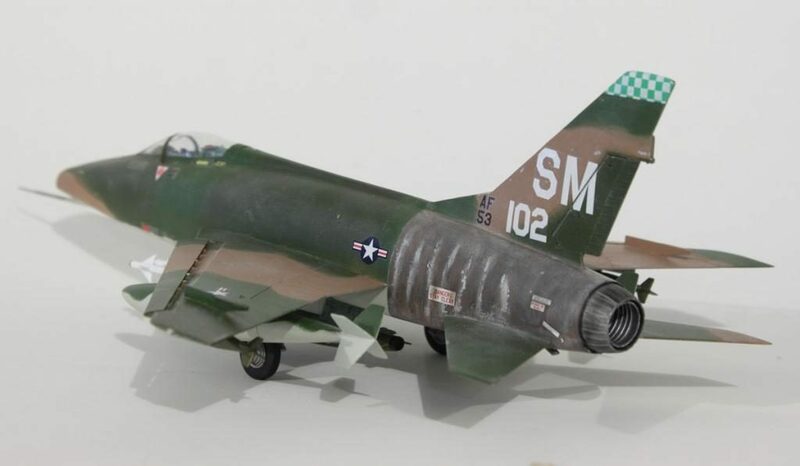 Maybe someone makes a bottle or can of that, but I don’t have it…searching images for how the rear should look showed the ‘burnt’ part is right, but there is a great variety – from bare metal, to purple, black, brown and some left over original paint. So I did the best I could with the silver base, washes of thinned black and brown and the weathering powders. 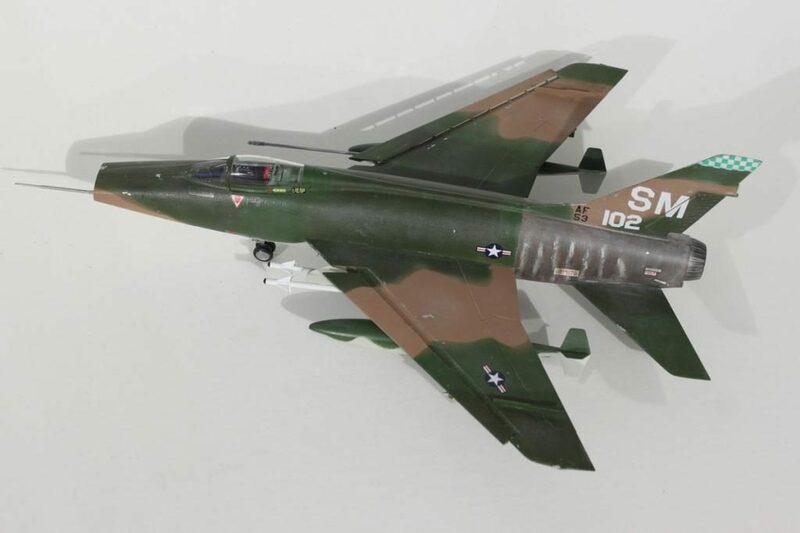 Note to aspiring F-100 modelers: see http://www.f-100.org/hun.shtml for a treasure trove of images to use for reference, many in color. The kit goes together very, very well. The biggest complaint I have is that the instructions are a bit lacking in assembly details.. Also, although a very nice color painting guide for each version is included, which is most useful overall, many individual part colors are not specified, so I took my best guess on some of them. Ralph, it really looks like a Hun! The burnt rear fuselage is difficult to do, at best. I like your version. I think one of the paint companies makes a “burnt metal” paint, Can’t remember which one, typical. The old brain is not as quick as it used to be, plus there’s just too much new stuff to stay current. It might be in Testors metallics, though probably in a bottle, not a rattlecan. Nice job on the paint, you can give Craig a run for his money! I’ve been wondering about the Trumpeter 100 versus the old Monogram. At least the D, as there is no F or C from anyone else in 48th. Yours is making me rethink that. Bad for the wallet, good for the stash. MUST RESIST! Rats. Thanks Bernard. Even if somebody does make burnt metal paint, I don’t think any single color can capture it. Ralph, years ago (?) there was this guy who had a way of using aluminum foil, boiled with an egg, that reproduced the effect. 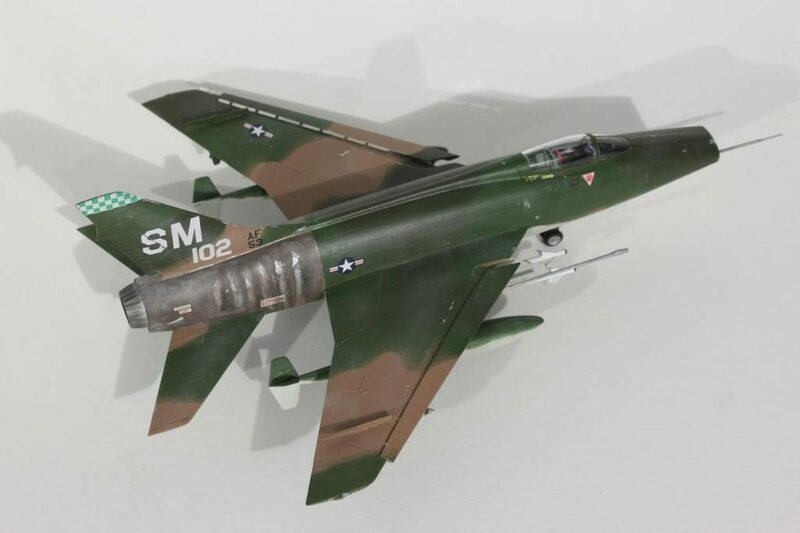 Once it got multicolored, you then glued the foil to the F-100. I thought that a little too intense a quest for looking right for me, plus my wife would have had me committed. Both Alclad and Model Master do a burnt metal paint. “Hot Honey of a Hun”? now that’s a compliment! thanks! Turned out spectacularly, Ralph…very nice build in my opinion. Good work! Nice looking build Ralph. The F-100 has always been a favorite and this model brings that HULKY feeling and appearance. Very good work. It looks really mean, Ralph, I like it very much. Impressive build Ralph, I like the metallic effect! A good selection of ordinance on there as well.